I haven't updated in a long while. I've had more going on than I feel I could handle at times, and felt I needed a break from things. Ironically enough - blogging has always been a saving grace. I really need to stick with it and stop being lazy :) Anyway, so I wanted to talk about the chalkboard fridge. I googled to my hearts content to get ideas, and saw many people were sanding, and priming with magnetic paint, etc. I am far too lazy for that. I didn't want to put money into my fridge that was gifted with my home purchase in 2004 - given that I am certain it doesn't have a long life left in it. Armed with Rustoleum's chalkboard paint, I figured I'd give it a test. You know, the scratch test. (Paint it, let it dry scratch it with your nail, if it doesn't knick you're good to go). Oh, and because I didn't want to shell out $20-$30 for magnetic primer, I tested it with a magnet as well. As luck would have it, it passed both tests. AND, my fridge is INDEED the bumpy surface type. (joy). So with a tiny roller, I applied the first coat, waited a day and did the second. And that's all it took. 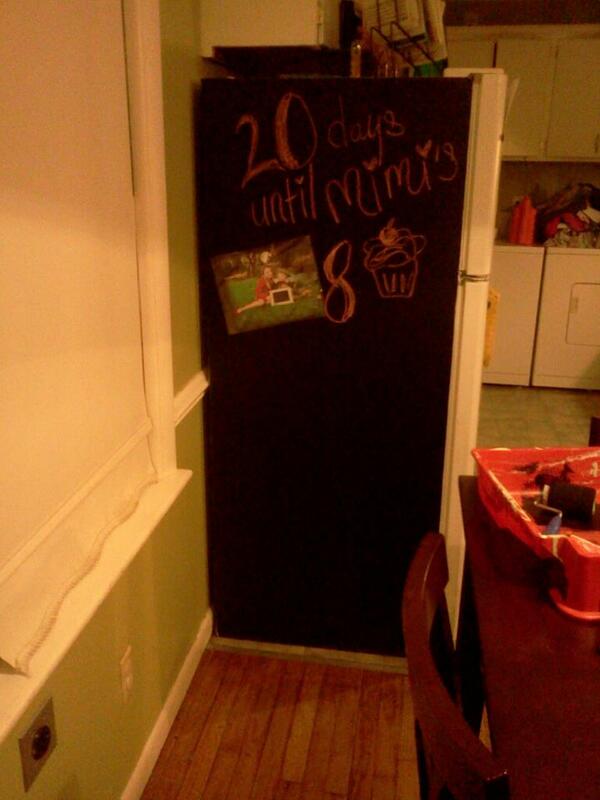 Chalkboard Fridge with NO PRIMER and NO SANDING = happy mama! Really, NO magnetic primer, NO sanding, just trusty Rustoleum's chalkboard paint, all by it's lonesome. Of course, I used Mr. Clean and wiped down the fridge and let it dry before doing any of this. When I clean it I use a rag with Mr. Clean as well before re doing a drawing or message - keeps it nice and contrasted with out too much chalk dust. I've had it for 2 months now, and use it all the time - works like a charm. I LOVE IT. I love even more that it didn't cost me a dime since I had the paint left over from the kid's closet doors. I am a happy mama! - And I just may paint the entire fridge in chalkboard paint, although I am still undecided.